Here's a story which raises more questions than it answers. Rather than a street map effort, the placement and angle of the cameras suggest that this is a part of a self-driving car project. This unit was occupied (the driver would not answer questions), so we're probably not looking at an actual self-driving car but rather a test-bed which has a person driving it around collecting video and other data for the software to respond to. 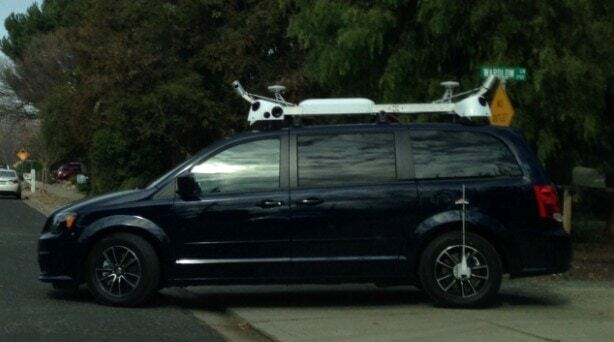 And according to the local CBS affiliate, the minivan's DMV records say that it is leased to Apple. That's a strange choice of words; if Apple were developing a self-driving car I would think they would own the test-bed vehicle, not rent it. So is this Apple's self-driving car? That's what some, including MacRumors, are saying. But I just don't have enough information to say for sure. I could see Apple having someone drive the vehicle around Cupertino, yes, but can someone explain how it would also show up in Brooklyn? And why? That's what keeps tripping me up, and it's why I wonder just who owns this car. Google's cars are clearly identified, and most of the university with this kind of project are open to talking about it, so that leaves one of the 6 companies with a license to test a self-driving car as well as any of a hundred tech companies capable of strapping a camera rig to the top of a minivan and having someone drive it around. As i said, there are more questions than answers here, and until one or another tech company steps forward and claims the car as theirs, we just won't know for sure. P.S. Is anyone else tempted to stage a minor fender bender just to get insurance info out of the driver? No? it's just me, then. It makes perfect sense for a corporation to lease vehicles from an accounting/tax perspective, especially a likely fleet of vehicles that are going to put tens of thousands of miles on them very quickly. It makes absolutely no sense that Amazon could somehow register the vehicle with the California DMV using Apple’s information. I am firmly in the camp of it being a mapping vehicle and not a self-driver, for which there is almost no evidence to support the claim. Rather than being street view 360° photography, it may just improve map quality… or, and this is far more speculative, I wouldn’t be surprised if Apple has modified C3s aerial photography-based 3D modeling and/or WiFiSLAMs wifi-based mapping to automobiles to produce much more accurate, ground-level mapping. Noted. I deleted the references to Amazon. It says something that many blogs seem to have forgotten that Apple Maps has a 3D structure component. The scanning system that Google used (it has undoubtedly changed from the last time it was in the news) for their 3D data was arranged differently from the cameras used for Street View. In my defense, that is a detail I never knew. Okay, not much of a defense. Didn’t mean to direct that at you specifically. I just find it funny that Apple Maps has become… well, it’s no Ping, but it must be rough working in that division. As Tim’s comments made clear, I could have put more research into this post. I need to do better.